Peta was lucky enough to be able to attend an amazing one day work shop on pelvic pain. It was great to see that the subject was being addressed by a multidisciplinary team. The presenters included gynaecologists, an anaesthetist, specialising in chronic pain, a women’s health physiotherapist, psychologists, and a pharmacist. It was great to see that they all saw the need for women to stay active when living with this condition. A great resource has been developed by by the Pelvic Pain Foundation of Australia. Check out their website (http://www.pelvicpain.org.au) It covers so many aspects of both women, teens and men living with pelvic pain. 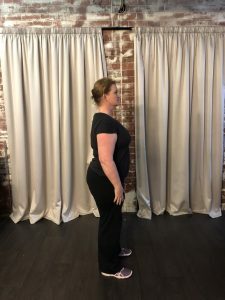 We are starting to see more and more women in the studio with pelvic pain, and it was great to see that with input from their medical and allied health team they are able to put some movement back in their routine. 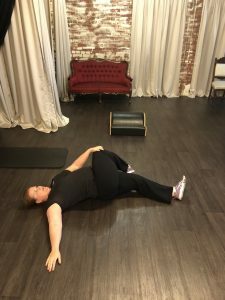 In many cases stretching can help with the pain. The Pelvic Pain Foundation have some stretches on their site. 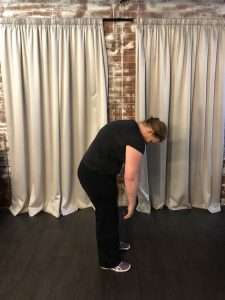 We have developed some active stretches so that they can be easily done at home. 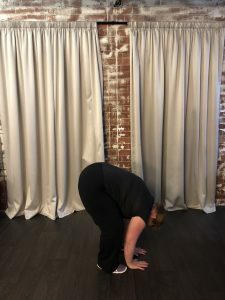 If you have pelvic pain it is so important to have it assessed by a professional, these stretches should only be used if they do not increase your pain. Start with a visit to your G.P so you can get a referral to your friendly gynaecologist. Another great resource is the Continence Foundation and women’s health physiotherapists. 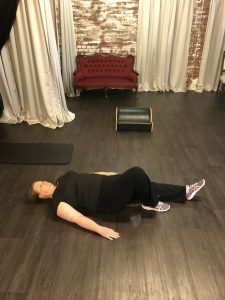 Start by lying on your back with both legs straight. 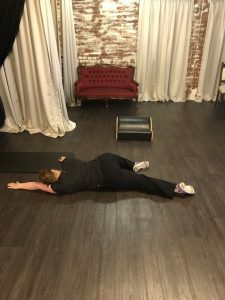 Bring your left knee in towards your chest, hold the knee with your right hand. Now bring your left knee towards your right shoulder then bring the knee down to the floor on your right side. 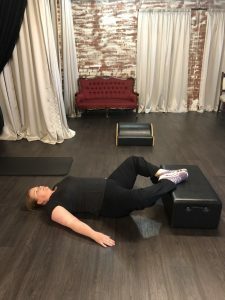 Transition into a rest position, lying on your tummy, keeping the knee bent. 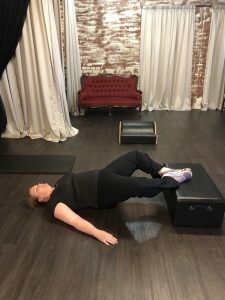 Return to lying on your back and repeat with the right leg. 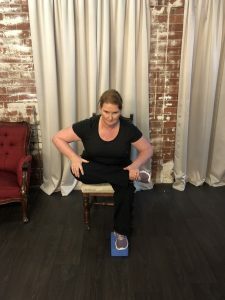 Glute stretch in motion Seated on a dining chair, cross your right ankle onto your left knee. Keeping your spine in a neutral position, rock forwards and backwards 10 times to help release the pelvic floor. Repeat on the opposite side. 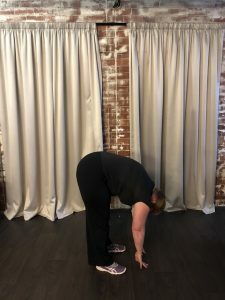 Rocking in 3 positions Start on all 4s, hands underneath your shoulders and knees underneath your hips. Starting in a parallel alignment, start to rock forwards and backwards, keeping your spine in a neutral position. 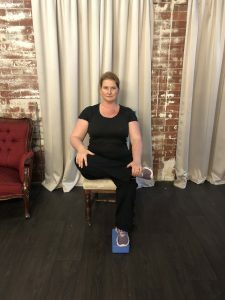 Now bring your knees together and feet apart then rock forwards and backwards. Lastly, bring your feet together and your knees apart then rock forwards and backwards. Repeat 10 repetitions in each position. 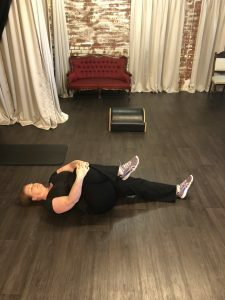 Frog pelvic curls Lie on your back with your knees bent and your feet resting on a stool. 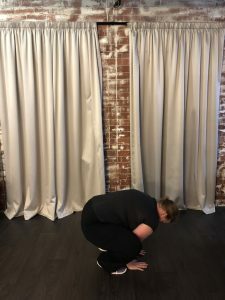 Bring the soles of the feet together, allowing the knees to open, like frog legs. 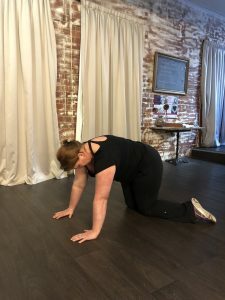 Initiate your pelvic curl by tucking your pubic bone towards your nose then roll up through your spine. Roll back down, ribs, waist, hips then bottom. Repeat 10 repetitions. Roll down with frog Standing with your feet hip-distance, drop your chin towards your chest and start to roll down through the spine. 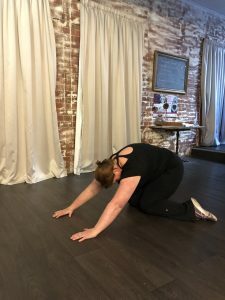 At the bottom, place your hands on the floor with your knees apart, arms inside your knees. 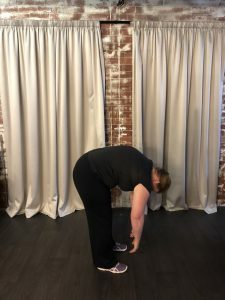 Keeping your hands on the floor, try and straighten your legs then begin to roll back up to standing. Repeat 10 repetitions.